Online Problem Solving – Problem Statement | Inventing Situations. 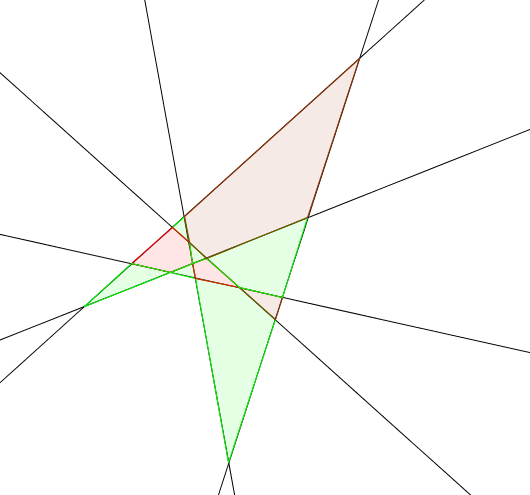 A nice problem: Given n lines in general position, how many regions do they break the plane into? How many are bounded, and how many are unbounded? (In this picture, there are six lines, 10 bounded regions, and 12 unbounded regions.) What if we work in 3 dimensions, with planes instead of lines? Can we generalize to k dimensional space? One of the big discussions we’ve (myself, David Stern, Toni and Alan Beardon, and occasionally David Minga) been having these last couple weeks is, ‘How can we develop online materials that do a good job of teaching problem solving?’ In a lot of ways, a good problem solving course is one of the most important parts of an education in mathematics. One gains a flexibility in approaching problems well beyond trying to reproduce an answer on an exam, and encounters numerous techniques and ideas that will motivate later coursework which might otherwise seem really dull. (Linear algebra comes to mind: it’s stupidly important, but can seem really obtuse if you encounter it in a void.) General problem solving skills also translate to a wide variety of contexts outside of mathematics: How do I approach this issue flexibly and adapt it into something I can address with the tools available to me? Furthermore, can I solve bigger problems with my tools than the one immediately in front of me? The best solving courses take the form of a conversation between students and teachers. It’s about developing the skills to get started, to actually act on a problem creatively, rather than reproduce what a teacher tells you. So a good problem solving course typically focuses on getting the students to actually solve problems, with a relatively small amount of guidance and advice from the instructor. But this method is heavily reliant on reactive, non-linear instructor interaction. Generally, it’s agreed that this is at the core of why it’s hard to put high-quality math courses on line. How do you foster creativity with a computer interaction? Because this is such a hard problem, it’s an important problem to try to find a solution to! Anything we come up with should be helpful in other math courses and other contexts, even if the solution to the original problem of online problem solving isn’t entirely solved in itself. This is obviously a lot to work on! There’s a lot to learn and a lot to do, and I’m feeling like I’ve written enough to get the idea out for now… Obviously, this will be a topic to come back to.